Our duct hose product line includes a variety of ducting for dust recovery in wood shops. Wood or sanding dust is more abrasive than typical ventilation dust and requires a more abrasion resistant material. Static and temperature may also be of issue in high volume applications. 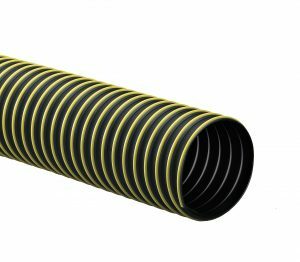 Thermoplastic spring wire duct hose is suitable for light duty applications, while urethane ducting is recommended for more demanding applications. Urethane duct hose is available in standard (0.030” thick), light (0.015” to 0.020” thick), and heavy grade (0.045” to 0.060” thick), in clear or black wall, and also in static dissipative formula. 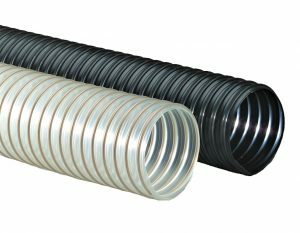 Duct hose is also available with a plastic helix for a smoother interior and can include a static grounding wire.